The blue bar on the right represents the United States' incredible good luck in between major hurricanes. 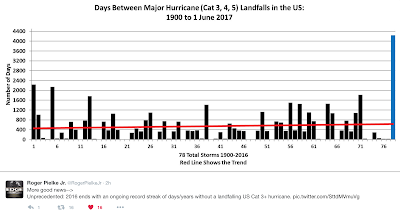 over 4,300 days as of May 31, 2017 (hurricane season begins June 1). The second-longest interval is the bar at the far left. Had Hurricane Matthew struck Florida, our luck would have ended but it stayed right off the coast and weakened before its Carolina landfall.